Tabula Mundi Tarot - Majors only limited edition of 495 in color with silver foil, signed and numbered by the artist. Card backs are cream colored with a black design. 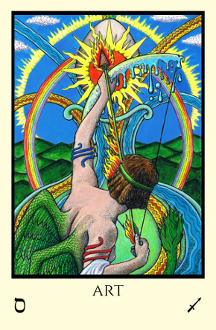 Includes 22 cards of the Major Arcana plus a signature card with Golden Dawn titles. Attributution symbols, both Hebrew letter and alchemical or astrological, done in silver foil on each card. Cards come in a stardust onyx band with a silver wax seal in a stardust onyx envelope with a silver lock and key design.